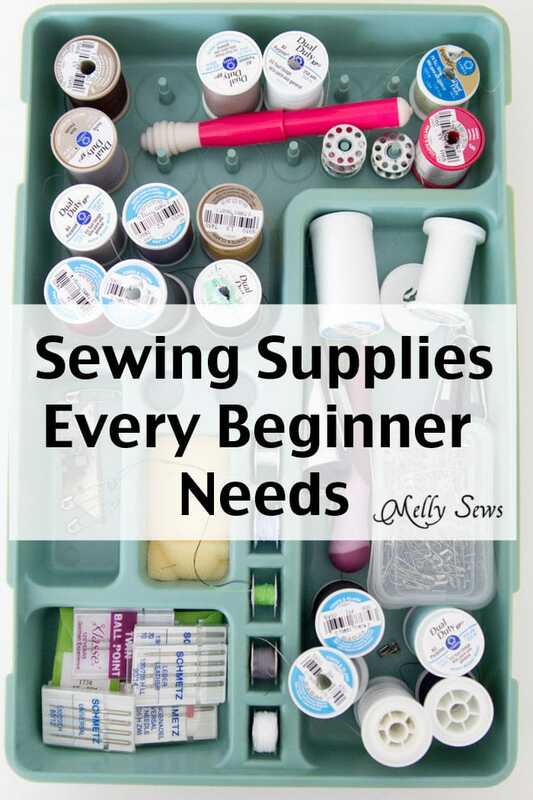 Hey y’all – one thing that can be overwhelming or a complete surprise for beginner sewists is supplies. I mean beyond a machine and fabric, what do you actually NEED to have to start sewing? 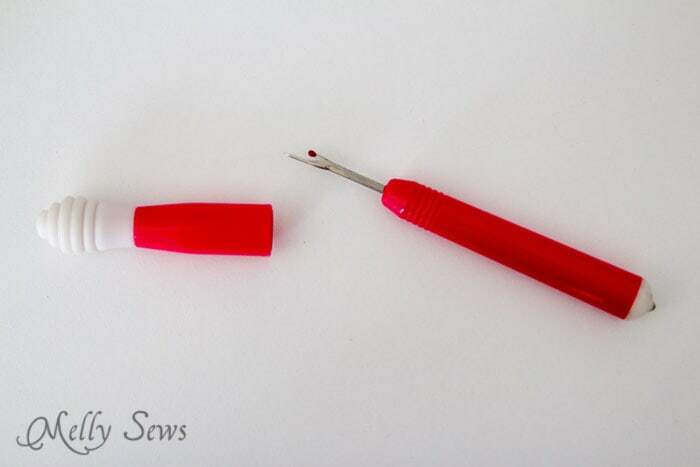 Today in a sewing for beginners post I’m going to cover the 5 must have tools to start sewing. And there are really only 5. If you’ve been sewing for a while, feel free to chime in in the comments with what your top 5 sewing tools are. Oh, and PS – there’s a giveaway at the bottom of the post, so make sure to read the whole thing! If you’ve ever stood on the notions aisle at a fabric store, staring at all.the.pins. and having no idea which ones to get, it can be discouraging. 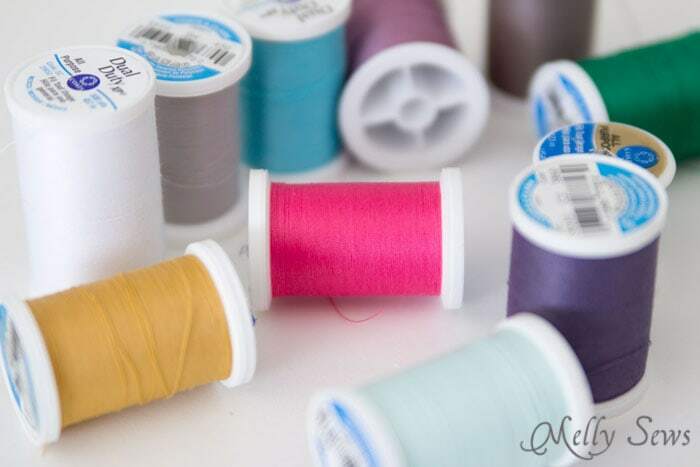 You’ll sometimes find a pre-packaged sewing kit, but the problem with those is that they may include things you don’t need (like who actually uses those teeny tiny spools of thread?) and the quality of the items you do need isn’t always great. So, in no particular order, these are the bare minimum things that probably didn’t come with your sewing machine that you need to start sewing. That’s it! 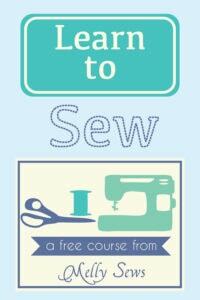 Take those 5 things, some fabric and your sewing machine and you can get started sewing. Let’s elaborate on each – plus I’ll give you links to order online, so you can avoid the pin overload confusion at the store. The product links in this post are affiliate links, so if you use them to purchase I get a small percentage of the sale, and you’ve helped to support this site! I swear by my 20 year old pair of Mundial scissors. Another popular brand of scissors is Gingher. However, if those are out of your current budget, Fiskars also work well and are affordable. Regardless of what brand you go for, look for blades at least 8 inches long, and ONLY use this pair for fabric cutting. 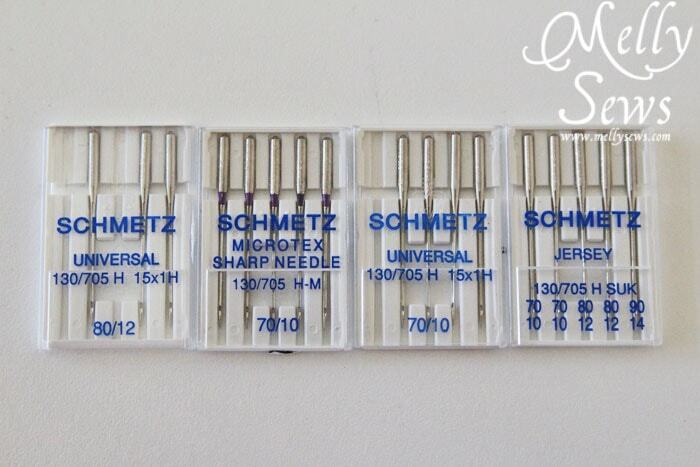 Unless I’m doing specialty work, (like a twin needle hem when I opt for Klasse needles), Schmetz needles are my go to brand. Get a pack of assorted sizes of universal needles like this one when you’re beginning, and you’ll be covered for most sewing situations. Later, when you venture into sewing knits, leather, denim, etc you can add to your needle collection with specialty needles for those materials. The choices for pins can be overwhelming – there are so many variations on that aisle at the store. These glass headed fine pins are my favorites. The reason is that the glass won’t melt under the iron (like plastic heads can) the fine width means that the pins slide easily into most fabrics, and if you accidentally sew over one, they are likely to bend instead of breaking your needle (though the needle can still break, so be careful). The glass heads also help you see them against your fabric, where pins with plain metal heads are easily overlooked. The only drawbacks are that their thin width means they can bend when you work with thicker fabrics, and the shorter length is also sometimes hard with those same thick fabrics. You’re going to make mistakes. (In fact, I recommend that you do!) And so you’re going to need a seam ripper. I have both an ergonomic one and this plain one, and both work fine. The only thing I recommend against with seam rippers is those tiny ones that come in sewing kits and sometimes with sewing machines. Spend the $4 to get a hand sized one and avoid hand cramps that the tiny ones will give you. There are lots of threads out there. And lots of opinions about thread. I’ve been happily sewing with pretty basic Coats and Clark All Purpose threads for years. This is a nice assortment of them if you want a starter kit, but honestly I just buy as I go and keep black, white, navy and gray on hand. Now as promised, I have a giveaway – one winner will get a pair of Mundial Dressmaking Shears shipped to them! This giveaway is open to US residents only, 18 years old and over. One winner will be drawn randomly. Void where prohibited by law; giveaway ends February 6, 2015. Use the form below to enter. Loading… Get access to my free pattern gallery - sign up for my newsletter! Great post! You can do so much with only the basic things. Thanks for the great advice, and the generous giveaway! A pair of fine scissors is a wonderful luxury! Love your post the only thing I would add is a marking pen- the kind that yummy wet and it disappears. Don’t know what I would do without one. I liked your comment about using scissors I have to hide mine. I caught my hubby using my good ones cutting tin flashing. I kind of disagree with you, like a sewing machine and fabric, I believe the sewing machine needles and threads should be a given. Now a good pair of scissors, I need a pair, but I also believe a rotary cutter and therefor a cutting mat is necessary, of course this could just be me, but I can’t cut worth a darn with scissors. (maybe it’s because I have the wrong kind) And I can’t live without my Clover clips, Love them. Thanks for the giveaways. Hoping to win. fingers-crossed…!!! I’d like to know where you got that try showed in the first picture! 🙂 That’s awesome! I agree with your list of the basics. Good scissors are THE BOMB!!!!! There is a reason I waited until I had a 50% coupon to buy them, but they have lasted FOREVER!!! I have started investing in more expensive thread. A girlfriend once said, “Can you pull on the thread and break it? If you can, don’t sew with it.” If I am sewing something quick and costume-y for one of the kids and I know it is not going to be around long I will use cheaper thread. But if it is a garment for myself I am going to reach for better thread. Maybe because my machine is so old, but it seems like I have less thread issues with the more expensive thread. Just my opinion. 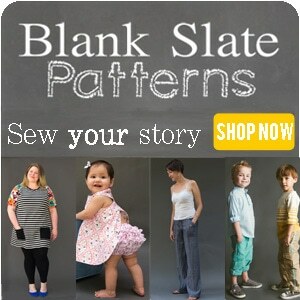 Thanks for the great blog!!! Yes I agree, the sewing items you listed are exactly what any new sewer needs. I would also maybe suggest some sort of ruler to them. Over the years I’ve found having my 6″ sewing gauge/metal ruler & my 18″ clear plastic ruler within reach when I’m sewing very handy. Thanks for all the work you put into your blog, I really enjoy it. Great list of the must-haves for our sewing rooms! 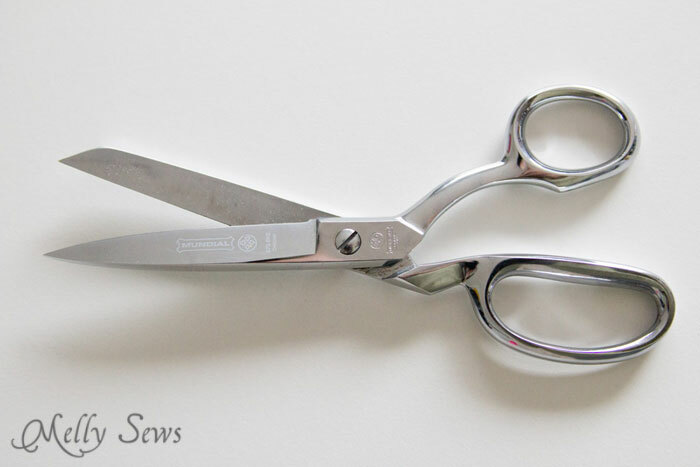 A new pair of scissors is on my list of things to update – not that I’d mind a trip to the fabric store or anything, but winning a pair would be delightful! Love your blog! The scissors look great! Thank you for sharing your ideas with us! I think your list is great. As a sewer I also would like to add that small metal hemming ruler to the list of must haves. I think I use that for every project I make. 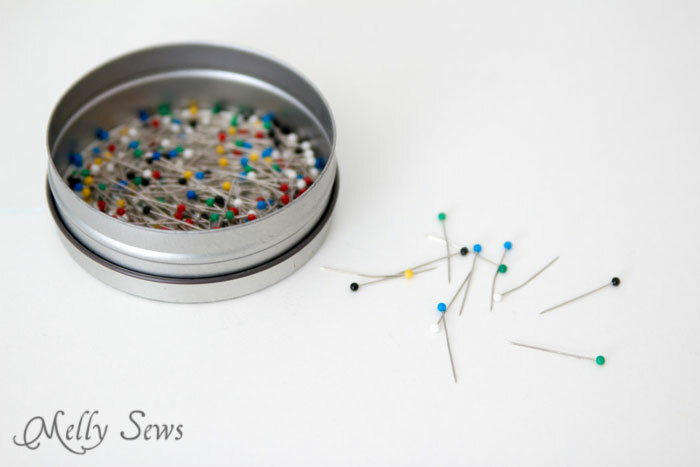 When I have those tiny thread spools, I put them into sewing kits with small scissors, safety pins and a few buttons and snaps for young people going off to college. Thank you for this post! I’m 16 and I want to learn to sew, and this is so helpful! I will definitely be coming back to your blog often. Thanks again! Your list of 5 items were spot on. They are exactly what my mom put in my first sewing kit , along with my first sewing machine (a Bernina). My seam ripper is my best friend. Some other great items are. A storage case or everything except the machine. Cutting mat and rotary cutter and acrylic ruler. Extra bobbins are essential as well. A machine needle threader will help a lot.